On March 14, the Japan Coast Guard (JCG) signed a contract with European defense contractor Airbus Helicopters for the purchase of an H225 Super Puma medium lift multi-purpose helicopter, according to a company press release. 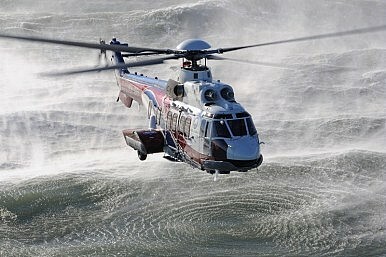 The JCG is already operating five H225 aircraft out of a total fleet of 48 helicopters. It also operates three earlier variants of the H225, the AS332 Super Puma, an all-weather transport helicopter originally designed for the French Army. In addition, the JCG’s air fleet currently consists of nine Bombardier 300 regional turboprops; nine Beechcraft King Air 350 turboprops; two Dassault Falcon 900 jets; four Saab 340 regional turboprops; one Cessna 206 piston-engine prop; three Sikorsky S-76 helicopters; 12 Bell 212 helicopters; 18 Agusta AW139 helicopters; five Bell 412 helicopters; and three Bell 206 helicopters. “We feel honored to have signed this contract with Japan Coast Guard for their sixth H225 and are grateful for our customer’s renewed trust in the aircraft,” said Stéphane Ginoux, president of Airbus Helicopters in Japan. The new helicopter is scheduled for delivery by the end of 2018. The JCG budget has remained steady over the past ten years, although the JCG has internally redistributed resources to make more funds available for the modernization and expansion of its fleet of surface vessels and aircraft. In comparison, in December 2015, the cabinet of Japan’s Prime Minister Shinzo Abe approved a record 5.05 trillion yen ($41.4 billion) defense budget for fiscal year 2016-2017, marking the fourth consecutive rise in defense spending since Abe assumed office in December 2012.